Ice Hockey - A Newcomers Guide ! Ice hockey games last one hour of playing time, split into three twenty minute periods. The clock is stopped whenever the game is halted. Most games will actually last a little over two hours of real-time including the stoppages and intervals between periods. Games in the English National League do not have overtime or penalties and a game tied after one hour will stand. Teams will normally have up to twenty players “dressed” for a game. During play they normally have six players on the ice at any one time; a net minder, two defenders, a left and right wing and a centre. Substitutions can be made on a rolling basis without the need to wait for a stoppage in play. Play is restarted following a stoppage using a “face-off”. 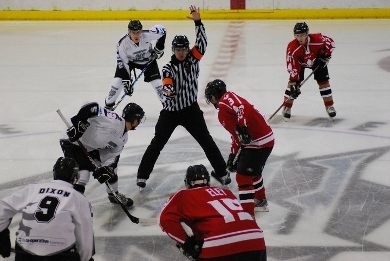 The linesman drops the puck between opposing centres who will attempt to pass the puck back to a team mate. There are nine face-off spots. A centre spot used at the start of each period and after a goal is scored, four spots in the neutral zone normally used after offsides are called and four spots, two in each defensive zone used following penalties or when a net minder has caught the puck. 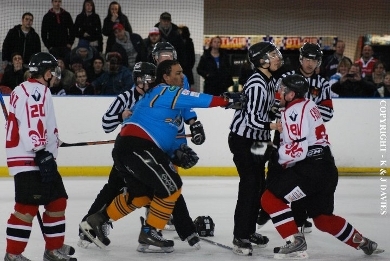 European hockey rinks are typically 61m long x 30m wide, though Solihull's ice pad is a little smaller at 56m x 27m. 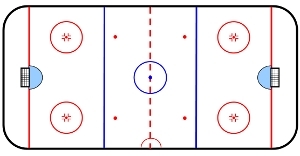 The rink is divided into three zones divided by blue lines. These are the defensive, neutral and offensive zones. There are nine face-off spots used to restart the game following goals, penalties, offsides and the start of each period. The goal sits on the goal line which is several metres from the end of the rink. This enables play behind the goal. Penalties can be called when a player is tripped, hooked (is pulled back by an opponent’s stick) and various other offences. The offending player will then have to sit out for 2 minutes or longer for more serious offences. 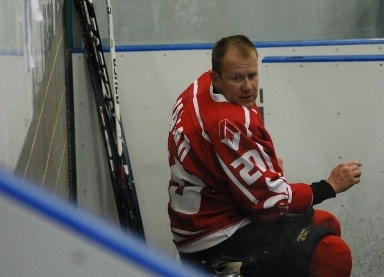 His side will then be a man down on the ice while the penalty is served and will be attempting to kill the penalty while the opposition are on the “powerplay”. The restart will happen in the offending teams defensive zone regardless of where the actual offence happened. If the opposition score during the powerplay, the remainder of the penalty is cancelled and the offending team can return to full strength. Images courtesy Keith Davies unless otherwise stated.